In his outstanding series of talks to young men preparing for ministry, Charles Spurgeon cited a theologian who famously said, "Study yourself to death and then pray yourself alive again." One can take this sentiment, reshape and reform it into a dozen others, in order to encourage young men who are about to enter into the ministry. For instance, we could just as easily say, "Preach yourself to death and then pray yourself alive again," "Write yourself to death and then pray yourself alive again," and "Evangelize yourself to death and then pray yourself alive again." Each of these statements carry with them the idea that ministry is an exhausting calling. Anyone who is seeking to be faithful in Gospel ministry should first prepare himself with a mindset of diligence and a willingness to "be spent" (to borrow words from the Apostle Paul) for the sake of the Gospel. This, however, is sadly not often the case with numbers of men who enlist in full-time Gospel ministry. In seeking to address this important subject, I want to consider some of the reasons why many are unwilling to pour themselves out in the service of Christ. Then, I want to encourage all who God has called to be ministers of the Gospel to go the extra ministry mile. One of the primary reasons why more ministers do not give themselves wholly to Gospel-ministry is that they have a divided sense of priorities in life. The Apostle Paul told Timothy, "No soldier gets entangled in civilian pursuits, since his aim is to please the one who enlisted him" (2 Tim. 2:4). The prevalence of a divided heart among men in ministry is also discovered in Paul's commendation of Timothy in Philippians 2:19-21: "I have no one like him, who will be genuinely concerned for your welfare. For they all seek their own interests, not those of Jesus Christ." This is a scathing indictment against men in ministry who have a divded heart. All of us, if we were honest, would have to say that we have loved this world too much. We have loved pleasure too much. We have loved comfort too much. We have loved adulation too much. We have loved ourselves too much. A divided heart is a great detriment to the minister's need to be striving for the sake of the Gospel. Someone will object at this point by asking, "Are you suggesting that a minister is supposed to neglect his family for the sake of the Gospel?" Who would not acknowledge that there is an enormous danger here against which we must all be on guard? Many have turned their ministries into their mistress, so to speak. I had a wise mentor who told me many years ago, "You can lose the church and keep your family; but, you can't lose your family and keep the church." His point was simple: If we neglect our family on the alter of ministerial success we will inevitably find that we lose true ministerial success in both the sight of God and men. Our ministry must begin with our wives and children. God has entrusted them to our care so that we would wash our wives with the water of the word and bring up our children in the training and admonition of the Lord. One of the qualifications for a man to hold office in the church is that he must "manage his own household well." Neglecting the spiritual, emotional, physical and financial needs of our families is ungodly. To do so in the name of ministerial commitment is a great danger against which we must vigorously guard. However, I have observed many young men, newly inducted into public ministry, who sequester themselves in the home with their wives and children. They are not out with the people of God very often. They are not in the community seeking opportunities for the spread of the Gospel. They treat ministry like a 9 to 5 job--clocking in and clocking out without being willing to give an extra minute to the needs of the congregants. If their lives were broadcast on a movie screen, no one would be tempted to say that they had given themselves, in a self-sacrificial sense, to Gospel ministry. Spending inordinate amounts of time with the family--to the neglect of ministerial responsibilities--in the name of fidelity may actually be nothing other than a smokescreen for ministerial laziness and an idol of comfort. A thing that has always peaked my interest in this regard is the way in which we hear almost nothing about the family life of the Apostle Peter in Scripture. The Scriptures tell us, in several places, that Peter had a wife. The Gospels detail for us the fact that Jesus healed Peter's wife's mother. Additionally, the Apostle Paul, in 1 Corinthians 9:5 writes, "Do we not have the right to take along a believing wife, as do the other Apostles and the brothers of the Lord and Cephas?" The only thing that the Holy Spirit has seen fit to leave for us in the Scriptures is a record of Peter's diligent labors in the evangelistic ministry to which God had called him--together with two letters that he wrote to the early church. Of course, there are important elements of his letters that deal with how a husband is to love and care for his wife (1 Peter 3:7). However, what we clearly see in Scripture is the way in which he gave himself to diligent labors for the sake of the Kingdom of God. Another reason why many ministers do not give themselves to a diligent outpouring of their lives in the service of the church is because they have entered ministry for the wrong reason. They didn't have a burning desire to preach the Word, shepherd the flock and evangelize the lost. They didn't have a pastor tell them that they had unique gifts from God for Gospel ministry. They thought that they might find a sense of fulfillment in ministry. After all, the experience that they had in campus ministry in college left them with a sense that helping young adults through difficult coming-of-age challenges seemed to be richly rewarding. Or, perhaps, they reveled in the thought of setting their own hours. Many have viewed the ministry like a business. Being a pastor to them is like being a business owner. You don't have someone breathing down your neck to get work done. Still, for others, ministry is a way to have a public platform. The longing to be noticed drives them to pursue a call to the ministry. People would finally listen to them when they stand in front of them week by week to preach and teach. Whatever the case, of this much we can be sure--many will never be diligent in Gospel ministry because they haven't been called by God to be in full-time pastoral ministry. There are a number of tests by which a pastor can discern whether a young man is sincerely zealous in his pursuit of Gospel ministry or if he is pursuing it for wrong motives. One such test has to do with his commitment to the life and ministries of the local church prior to heading off to seminary. If a man is not committed, in a superlative way, to the regularly scheduled worship services, Bible studies, outreach events, etc. why in the world would a pastor assume that he will be a diligent minister of the Gospel once he makes it through seminary? Seminary doesn't give a man a heart for the ministry--it simply gives men the requisite tools for ministry. Having said all of this, I recognize that there are men who have been called by God to enter the ministry, who have a zeal for the spread of the Gospel and the care of the people of God but who struggle at times to be diligent in their labors. There have been many times when I have been weary or worn to the point that I have not wanted to go the extra ministry mile. When those times come, I remind myself of the example of the Savior. Jesus was often weary and worn; and yet, he pressed on in seeking to fulfill the ministry for which he was sent by his Father by giving himself to prayer (Mark 1:35; Luke 6:12). There was the time when he was exhausted from ministry and so he sat at a well (John 4:6), where he then engaged the Samaritan woman with great evangelistic love and diligence. There were also times when the disciples needed rest from the weariness of ministry (Mark 6:30-32); however, no sooner had Jesus pulled away with them for that purpose that a multitude found them and Jesus sent them back to ministerial labors (Mark 6:33-44). This is not to say that we do not need times of rest and refreshment. As I write this, I am on the tail end of a short Sabbatical. Spurgeon himself would often retreat to the English oceanside in order to regain spiritual and physical strength after being weighed down by the burdens of ministry. 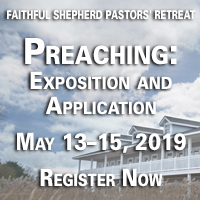 So, while we should emphasize that it is imperative for ministers to get adequate rest and refreshment, we must equally emphasize the dire need that ministers have to pour themselves out in the service of Christ in the ministry. After all, the Scriptures tell us, "Whatever your hand finds to do, do it with your might; for there is no work or device or knowledge or wisdom in the grave where you are going" (Eccl. 9:10). With that sobering reminder, let's be ministers who are willing to go the extra ministry mile.